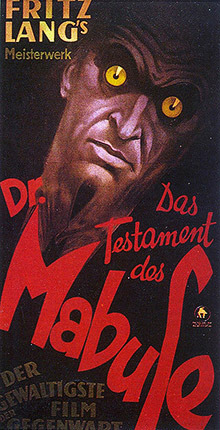 The Testament of Dr. Mabuse (German: Das Testament des Doktor Mabuse) is a 1933 German noir film directed by Fritz Lang. A decade after the success of Dr. Mabuse, the Gambler	, Lang decided to revisit the character in the sound era, with a plot appropriately based on the eeriness of recorded sound. In the film, it is ten years or so since the criminal empire of Diabolical Mastermind Dr. Mabuse was crushed by the authorities, and the evil doctor, driven insane by his fall, confined to a mental hospital. Suddenly, the catatonic Mabuse has reawakened and begun to obsessively scribble notes on hypothetical crimes. Which would only be of academic interest, if it weren't for the new criminal gang that seems to be putting those plans into practice. Opposing them are Police Inspector Lohmann (Otto Wernicke), who'd appeared in Lang's previous film, M, and Kent (Gustav Diessl), a down-on-his-luck criminal who joins the gang but soon grows disgusted with their extreme measures. This was the last film Lang made before leaving Germany. Those Wacky Nazis, who had come to power just two months before the film was scheduled for release in Germany, promptly banned it. It's generally assumed (thanks to Lang's own testimony) that the Nazis considered it a Take That!, though this isn't certain. After all, the Nazis had praised ''M'' as an alleged "pro-death penalty" film. Joseph Goebbels, Hitler's Propaganda Minister, publicly objected to Testament as "a practical guide for criminals" rather than ideology - though he reportedly kept and screened a private copy for himself. Regardless, Lang, whose mother was a practicing Roman Catholic but Jewish by birth, left Germany soon after and made his way to Hollywood. Lang's wife Thea von Harbou, who had been his screenwriter and creative partner for almost all of Lang's career, joined the Nazi Party, divorced Lang, stayed behind in Germany, and worked in the Nazi movie industry until the end of the war. A quarter-century after he left, Lang came back to Germany and made another sequel, The 1000 Eyes of Dr. Mabuse. The movie was remade in 1962, the remake being retitled The Terror of Dr. Mabuse in English. Testament had a complicated release history. Lang's original German cut saw limited release in Austria and Hungary in 1933. A French-language version, shot simultaneously by Lang with French-speaking actors, became the basis for most international prints. While the Nazis initially banned Testament, they released a heavily-edited version in the late '30s. The biggest change was added narration by Inspector Lohmann stressing the Weimar setting and claiming Mabuse was Jewish. Testament didn't reach America until 1943, in the midst of World War II, when it was again reedited, this time to emphasize the Nazi parallels. Indeed, some versions added dialogue comparing Mabuse to Adolf Hitler. In 1952, a heavily cut (from 124 to 82 minutes), English-dubbed version entitled The Crimes of Dr. Mabuse appeared, which remained the standard version for several decades. Lang's original German cut didn't resurface until 1973, when it was re-released to general acclaim. Action Prologue: A classic Bond opening. The film gets off to a flying start, interjecting a narrative that appears to be in full swing as a man tries to escape from a building, narrowly missing being killed. Lohmann says Hofmeister "must have gone out of his mind with terror", and there is a quick cut to a psychiatrist at a lecture describing exactly that condition. Later in the movie the cops are discussng a criminal and looking at his picture—cut to the criminal wearing the same clothes and in the same position. As You Know: When Kommissar Lohmann's assistant tells him that someone named Hofmeister has called, Lohmann makes sure to say "Our former colleague who got into trouble with foreign currency?". The Atoner: In the first act, Hofmeister wants to redeem himself before his former mentor Lohmann by investigating a money-forging operation on his own. Bedlam House: Unexpectedly averted. The place isn't exactly cosy, but even though the head psychiatrist is batshit crazy, the patients don't seem to be ill-treated and most of the staff seem decent. Berlin: The film clearly is set there — the spectacular robbery of a jeweller's shop on Unter den Linden is mentioned — but the Eiffel Tower Effect is averted as the outdoor scenes all were filmed in nondescript neighborhoods. One does get an inkling that Berlin University had one of the world's leading medical faculties at the time when the camera pans across a mixed row of Professor Baum's students before coming to rest on a man who is either Chinese or Japanese. Bond Villain Stupidity: Kent and Lilli locked in a room, being given three hours to anticipate their deaths. Canon Welding: This film pits Dr. Mabuse against Kommissar Lohmann from M.
This is alluded to when the archivist goes to recover the files and drops the title of the first film, "Dr. Mabuse, the Gambler" while holding a fat document that was apparently the script of the earlier film. Dead-Hand Shot: Of a Mook after he shoots himself rather than be taken alive. Devil in Plain Sight: Baum is publicly vocal about his admiration for Mabuse even before he starts going seriously round the bend. Does This Remind You of Anything? : A few things. The scene where Hofmeister looks at Lohmann and the police doctor standing in the door of his cell briefly shows a distorted, expressionist decor very reminiscent of The Cabinet of Dr. Caligari. Driven to Madness: Hofmeister. Also Baum. Driven to Suicide: A number are reported to have happened off-screen. Drowning Pit: Kent risks deliberately turning the room he and Lilli are imprisoned in into this, in the hope that the water will absorb the force of the explosion. Dunking the Bomb: Mabuse, in a shining example of Bond Villain Stupidity, locks the good guy and his girlfriend in a room with a bomb set to go off in three hours. The good guy opens up the pipes and deliberately floods the room in an effort to muffle the explosion. They almost drown, but in the end it works. Even Evil Has Standards: Kent. Fat and Skinny: Hardy and Bredow. The Film of the Book: Subverted. The screenplay is based on the novel Dr. Mabuses letztes Spiel ("Dr. Mabuse's last game") by Norbert Jacques, which at the time was still unpublished and would only come out in print in 1950. For the Evulz: Mabuse's motivations in this film are purely to create chaos and a Hobbesian-nightmare "Empire of Crime". Lampshaded in scenes where some of his minions discuss their bemusement at why they're being paid to commit crimes that don't actually seem to make any money. Grand Theft Me: One possible interpretation of the film is that Mabuse succeeds in doing this on Baum with his psychic powers. HeelFace Turn: Kent's barely a villain to begin with, but he rapidly turns against Mabuse once he realizes how insane his scheme is. Herr Doktor: Apart from Dr. Mabuse and Professor Baum there's Dr. Hauser, who works as one of Mabuse's blackmailers. High-Class Glass: Among Professor Baum's students is a woman wearing a monocle. His Name Is...: Hofmeister is attacked just as he's about to tell Lohmann who the bad guy is. Unusually, instead of being killed, he's driven mad. As it turns out, Hofmeister managed to scratch the name into a window pane with his diamond ring, but it takes halfway through the movie for the police to decipher it. Hypnotic Eyes: Mabuse still has them. Lecture as Exposition: Baum's lecture on Mabuse, which gives a condensed run-down of the plot of the first film, and sets up his undue admiration of his patient. The Man Behind the Curtain: Dr. Mabuse. On the surface he turns out to be a cut-out silhouette and a loudspeaker when Kent tries to shoot him, but his real identity becomes revealed eventually. Foreshadowed in Professor Baum's lecture when he describes Mabuse's role in the first movie as that of the man behind the curtain. Maybe Magic, Maybe Mundane: Whether Baum was simply mad, or whether Mabuse actually did manage to do a Grand Theft Me on him by some mystical means. Might as Well Not Be in Prison at All: The central mystery is how Mabuse is achieving this. Minor Crime Reveals Major Plot: Four of Mabuse's minions get killed or arrested because one of them stupidly gave his moll a stolen piece of jewellery to wear in public. Morally Ambiguous Doctorate: Mabuse and Baum. Also Dr. Hauser, one of Mabuse's mooks, and Dr. Kramm, who wants to report the similarities between Mabuse's notes and the off-screen jewelry heist to the police and is murdered. My Death Is Just the Beginning: Dr. Mabuse may be dead but his writings still exist, waiting to be unleashed on the world. In the finale, Baum, in his madness comes to find the doctor possessing him entirely. Napoleon Delusion: Baum fully believes by the end that he is Dr. Mabuse. A Nazi by Any Other Name: Ladies and gentlemen, the Ur-Example. Nice Hat: Many characters wear bowlers, and one of the mooks even sports a top hat. No Celebrities Were Harmed: As in M, Lohmann is modeled on Ernst Gennat (1880-1939), the head of Berlin's Mordinspektion M1, known to Berliners by affectionate nicknames like "the Buddha of the Alex" (i. e. the police headquarters on Alexanderplatz). No One Sees the Boss: The gang's "boss" is seen only as a silhouette behind a curtain, which turns out to be a cardboard cut out with a microphone and loudspeaker. Nothing Is Scarier: We never find out exactly what Hardy and Bredow did to Hofmeister to drive him mad. Posthumous Character: Mabuse, for the second half of the film. Psycho Psychologist: Mabuse's past as a psychanalyst is referred to, and his psychiatrist Baum initially starts committing crimes in admiration for him and finally becomes deludedly convinced that he is Mabuse. A Pupil of Mine, Until He Turned to Evil: In the first act Lohmann still feels a deep sense of personal betrayal by Hofmeister's past involvement in a foreign-currency racket. Punch-Clock Villain: Kent, even before he realises how deranged Mabuse's plans are. He starts the film genuinely trying to go straight and find honest work, and only very reluctantly joins the Mabuse gang to make ends meet as nobody wants to hire an ex-con, especially at the height of the recession. Real Time: Not within the film, but dialogue establishes that both this and the first film are set at the time of their release, with a ten-year-ish gap in between in canon. Sealed Room in the Middle of Nowhere: For Kent and Lilli, with a time-bomb included. Shout-Out: Arthur Miller in his autobiography, stated that he got the name for Willy Loman in Death of a Salesman from this film, specificially for a scene where one of the characters calls the detective "Lohmann" several times on the phone. Sympathetic Inspector Antagonist: Komissar Lohmann. Those Two Bad Guys: Hardy and Bredow are an early example, although they aren't as chatty as later examples would become. Those Two Guys: Mabuse's Organisation dramaturgically breaks down into pairs - Kent and the Lithographer, Karetzky and jewelry expert Griforiew are the prime examples, but there is also the nameless blackmailer and his partner - where one is beginning to feel uneasy about the methods used in or the apparent purposelessness of Mabuses wave of crime, while the other warns him not to incur Mabuse's wrath. To Create a Playground for Evil: Mabuse's motivation in this film is reduced to simply turning the world into a lawless hellscape. Villain-Based Franchise: The first of the sequels in what would become an irregular but long-running example. Villainous Breakdown: Baum is essentially having one throughout the film. The Voice: The "chief". Almost a pre-internet example of Voice with an Internet Connection.